As the cold weather finally starts to leave us alone, clever estate agents know it’s time to ramp up the advertising for new properties. 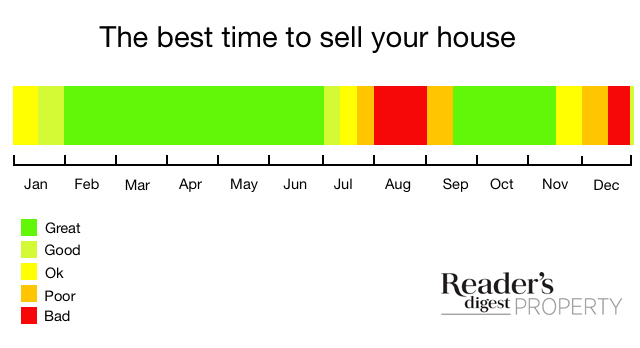 Between the end of the winter months and the height of summer is generally the sweet spot for house sales. Promoting estate agent services using outdoor advertising is a highly efficient way to reach potential buyers. When it comes to advertising property, timing is everything. We know that buying a property is one of the most important buying decisions we make in a lifetime. So being able to capture buyers in a specific area is an easy way to ensure you get the attention of the right people, in the right place. Using location, demographics and interests to target buyers who are best placed for the property you’re selling is easy with outdoor advertising. Outdoor advertising simply relates to all advertising outside of your home, that’s why it’s also called Out-of-Home (OOH). Billboards and buses are just one example of this medium, but there’s so much more! The underground, phone boxes, taxis and posters, the only limit is your imagination. So, when is the right time to use OOH to sell houses effectively? Spring is generally considered to be the best time to sell a house. Partly because of the better weather and gardens in full-bloom help to make properties seem more attractive. Aside from that — buyers tend to be out and about thinking about the future while property hunting. It’s a great time for families with kids to try and tie their move-in date with school holiday dates in summer. Yes, we know — real estate is all about location, location, location. But so is property advertising. Estate Agencies is one of those industries that is perfectly suited to outdoor advertising, purely because it’s such a geographically targeted business. Understanding the area surrounding the property is everything in real estate. Because word-of-mouth is still such a strong source of brand trust, building a reputation as being hyper-local and in-the-know only does good things for building a reputation as a local agent. As one of the oldest forms of advertising, OOH has proven time and time again that it is one of the best ways to attract customers with location-based advertising. Billboards and posters are the most traditional forms of outdoor advertising and are a fantastic way of getting attention in a local area. What better way to attract neighbouring residents to a fantastic property than advertising in the area they frequent every day. Billboards are a great way to make a lasting impression with your local audience, and makes big, bold statements. Bus advertising is another great way to make great use of local outdoor advertising. It works wonderfully with a targeted, geographical area. You can attract customers to a fantastic property in an ideal location with a bus advertisement capturing commuters attention. When it comes to making a standout estate agency ad, it’s all about presenting information that solves customer problems—with personality. It’s been four years since Purplebricks has burst onto the real estate scene in the UK. They were one of the first who captured sellers attention with the promise of a fixed-rate commission, and their campaigns have focused on “Commisery”, the misery you feel about over-paying on commission. 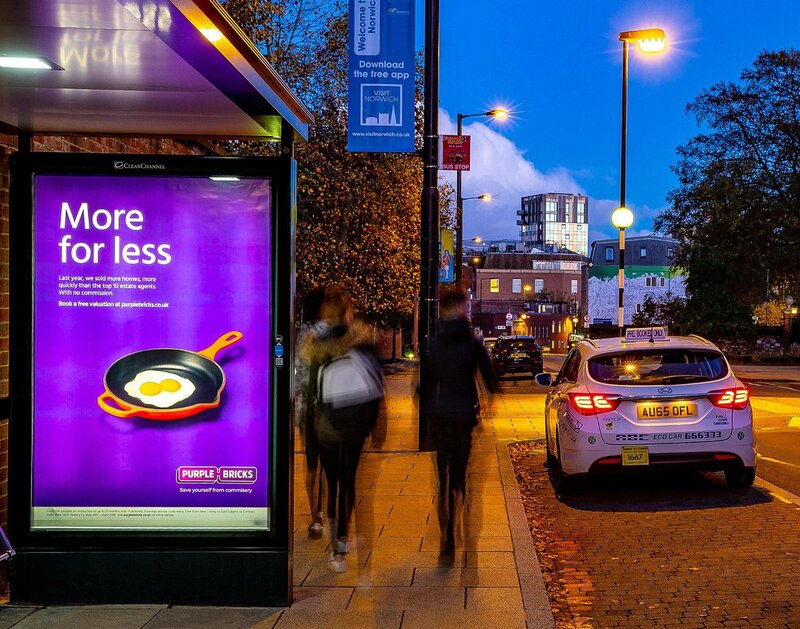 While Purplebricks typically used TV campaigns for brand awareness in their early stages, with the appointment of a new agency they’ve ramped up the use of outdoor advertising. With strategic placement on the London Underground to capture commuters attention, the Purplebricks campaign has been highly effective for brand interaction and buyers in the consideration phase. Being aware of the quiet times for property sales is the first step in ensuring you make the most of your outdoor advertising. The second step is using the medium to its full abilities. Neglecting your online focus won’t do you any favours, in fact, OOH works amazingly well with online advertising to give you a fully integrated campaign since it has the highest rate of online activation per dollar compared to any other offline media. That means that you can use your outdoor advertising space to really capture attention, and leave online to focus on all of the details. Combining an outdoor campaign with online compliments the industry nicely. Estate agency is one business where informing the customer of all the details is important, but keeping those details online so as not to bombard people in their day-to-day life is key to communicating your message effectively. Your creative should speak to the local nature of your business, and ensure locals understand that you’re well aware of the bonuses of the geographic region. Ready to make the most of Spring property buying time with a truly effective outdoor campaign? You’d better be quick to make sure you get the best spots to suit the properties on in your portfolio. Read this article about all the steps to get started, or start searching here. Planning for strategic Easter advertising Who do you reach with outdoor advertising?